With the holidays upon us, many of us find our stress reaching all-time highs, and our attention focused on material goods — not necessarily what we hope, but what in the world to give loved ones. Photo courtesy Deborah Wall The El Tovar Hotel sits directly on the South Rim of the Grand Canyon. The paved and flat Rim Trail passes by it and makes a wonderful place to take a winter hike. Neither condition is good, and for once, I am going to suggest that running away may be the perfect cure. A family trip to a national park can remove you from the pressure cooker of commercialized Christmas, promote togetherness and perhaps even start a family tradition. Many parks would serve this purpose, but none better than the South Rim of Grand Canyon National Park, Arizona. Though it’s one of our most crowded parks most of the year, right now it can offer you something approaching solitude. Yet it can also be, perhaps, the most beautiful time of year there. At an elevation of 7,000 feet, a fresh blanket of snow will enhance the canyon’s beauty for many days, making natural colors and textures seem to pop out like a 3-D movie on the widest screen imaginable. While just gazing into the canyon from different viewpoints is a once-in-a-lifetime experience, outdoor people will also want to hike at least one of the trails. The 13-mile Rim Trail, mostly paved, is well-suited for just about anyone. Its accessibility at multiple points allows you to select a segment to hike and return the way you came. But there’s a little more adventure in descending into the canyon. I recommend the Bright Angel Trail for that purpose. It’s one of the park’s most famous trails and is easily found, just west of the Bright Angel Lodge. Because the upper reaches of this trail can be hazardous with snow, ice or both, be sure to wear a pair of over-the-shoe traction devices such as STABILicers or Yaktrax, and use a pair of sturdy hiking poles. These handy gadgets are found at outdoor stores such as REI or available at the Grand Canyon Market Plaza. Just a few hundred yards after leaving the trailhead, you will walk through a man-made tunnel in the rock. Just after the tunnel, look high on the cliff wall into a small alcove named Mallory’s Grotto. There you will see Native American pictographs: red paintings on the rock, depicting elk. Bring binoculars for a better look. While hiking you might encounter a picturesque, wrangler-led mule train, as these trains carry passengers into the canyon year-round. If you would prefer to be on the mule, make reservations by calling 303-297-2757. Sometimes they can even accommodate you at the last minute, if you call 928-638-2631 and ask to be put on a waiting list. Another benefit this time of year is being able to drive your car on the 7-mile scenic Hermit Drive. It will be closed to private vehicles after Feb. 28, and until next fall will be accessible only by shuttle bus. At the end of this drive is Hermit’s Rest itself, a small building erected in 1914 and built to appear part of the natural landscape; its architectural ingenuity was one reason it has been designated a National Historic Landmark. Be sure also to head in the other direction and visit Desert View, 25 miles east of the Grand Canyon Village. The best viewpoint there is reached by climbing the 85 stairs in the watchtower . It is open from 9 a.m. to 4:30 p.m. Although one comes here to enjoy the outdoors, try to make time to go inside the visitor center and see the park-orientation film “Grand Canyon: A Journey of Wonder.” If I haven’t visited a park before, I always begin with the orientation film, to get a feeling of the park and make mental notes of points I want to visit. The movie is 20 minutes and is shown on the hour and half-hour daily, starting at 8:30 a.m., with the last showing at 4:30 p.m. 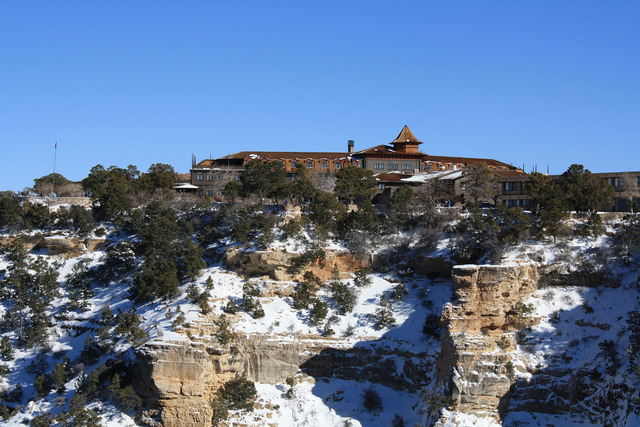 The Grand Canyon Visitor Center winter hours are 8 a.m. to 5 p.m.
For more information on Grand Canyon National Park, mule rides and lodging in the area, call 928-638-7888 or visit www.nps.gov/grca. Take U.S. Highway 93 south about 80 miles to Kingman, Arizona. Go east on Interstate 40 for 112 miles to Williams. Exit onto Arizona Route 64 and drive north for about 60 miles to the entrance to Grand Canyon National Park.